“Have boozy juice box, will travel.” That’s my motto this week as spring break takes me to sunny Mexico. 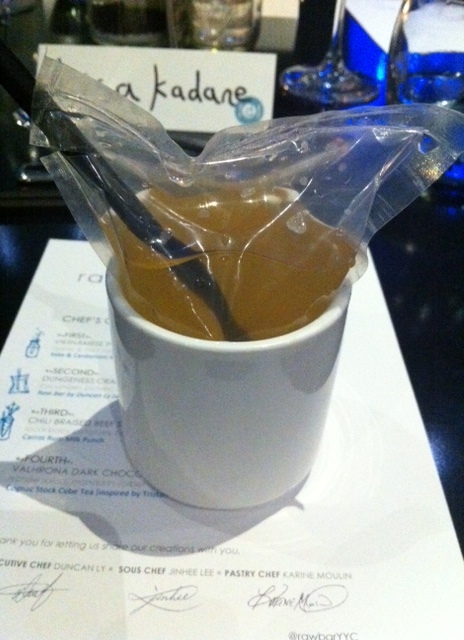 This inventive drink — a perfect hot-weather, tote-along pool companion — comes to us courtesy of the Hotel Arts Group, where I sampled it during Calgary’s Big Taste event at a cocktail dinner hosted by Raw Bar. This adults-only take on a refreshing juice box features white wine, roasted pineapple and bitters. Chugalug! Boozy Juice Box is basically a wine cooler made with roasted pineapple- and bitters-infused white wine. The pineapple complements the Pinot Grigio, adding a smoky sweetness, and the bitters give the drink a spicy complexity. At first sip I thought there was more to it than the recipe revealed. The good news is since it’s so simple, it would be a snap to make a large batch for a summer garden party… figuring out the delivery method (a bunch of juice boxes and straws) would be the hard part! Combine ingredients and marinate overnight in the fridge. Strain into a plastic pouch, add a straw and tote along to the beach or enjoy poolside. This entry was posted in Cocktails and tagged Big Taste Calgary, Boozy juice box, Noble Ridge white wine and roasted pineapple juice box, Raw Bar Calgary, Raw Bar cocktails, Raw Bar juice box, wine cocktails, winetail recipes. Bookmark the permalink.